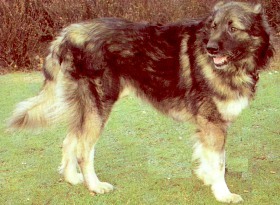 I am also sometimes called the Caucasian Mountain Dog and my relatives have worked for hundreds of years as guard dogs and herding dogs. My weather-resistant coat is very thick and I am large, strong and well-built. I have an assertive, somewhat aggressive temperament. I need firm, fair handling and proper socialization in order to be a good pet. I am definitely not a good "household pet" choice for the novice dog owner, but experienced handlers will find that I can be an excellent guardian and companion. When fully grown, I am between 24 and 33 inches tall (61 to 83.8 centimeters) and I weigh between 105 and 145 pounds (47.3 to 65.3 kilograms). We have no Caucasian Ovcharka Breeders listed at this time. Click here to place your Caucasian Ovcharka Ad!